Preface: April 2017. This trip happened in July and August of 2017, but its story began in April. My wife and I had a one-year old, and had recently decided to have a second child. I could foresee the fun of being a family of four, but I was definitely not looking forward to the first year of having two very young children: lots of diapers to change, and not a lot of leaving the house for adventures. Suzanne and I had gone on a bike touring honeymoon five years earlier, and we had plans to go touring with our children. A newborn, however, is not amenable to that, since most medical advice is to wait until one year old before subjecting a child to the bumps and vibrations of cycling. So when I said “I miss bike touring” it was with a degree of wistfulness, knowing that would probably be a few more years before I could do so again. This is a map of my tour that is written up in this post. It may not work with all browsers; it did not render for me on a mobile device (Chrome on Android), so if you’re not seeing anything here, maybe try a different device or browser. I have gone on three bike tours in Europe, mostly in France, but also in Germany, Italy, Ireland, and Switzerland. I just wanted to give a quick rundown of the ways that I have been able to find campsites, and also hopefully attract other people to this page you can tell me what to do for other countries. Wherever You Are: Try OsmAnd. I have only done this within France, but there’s no reason that it wouldn’t work in other countries except that the data coverage might not be as good. OsmAnd is an Android and iOS application that shows OpenStreetMap data, which is sort of like the Wikipedia of cartography. It also has the best filter to show a particular feature type — like campsites — even better than the online OpenStreetMap. Last summer I spent two weeks biking a loop in Normandy, and used this method almost every night in order to find a campsite. The main advantage of OsmAnd is that it has a lot of information, so it has both municipal and commercial campsites. The downside is that the data is not necessarily verified. One time I showed up at a campsite, and it used to be a campsite, but had become more like a trailer park. The people living there were friendly so I stayed there anyway. And the other ten times I used it I found a for-reals campsite. The idea is: there’s probably going to be a campsite where they are indicated, but is not guaranteed. Usually I did a quick Google search of the campsite name and town to verify that the campsite would actually be there. I’d be interested in hearing from anyone else who has used this method in other countries, and how accurate the campsite data is. In Germany, another good way to find campsites are ADFC biking maps. The ADFC is the national biking organization for Germany, and their maps show bike routes, bike shops, restaurants, and… campgrounds. They also exist as digital downloads, which requires some navigation of their only-in-German website. In France, Camping Qualite is a kind of campsite industry association that has its own map. They are usually going to be more full-featured and expensive campsites (so like twenty euros a night, with a pool and a playground). In Switzerland, the website Schweitzmobil has a configurable map that will show the Swiss national and regional bike routes, and various categories of accommodations. Probably the most useful configuration for readers of this post is showing national bike routes, camping, and farm accommodations. What others sources for finding campsites for bike touring are there? 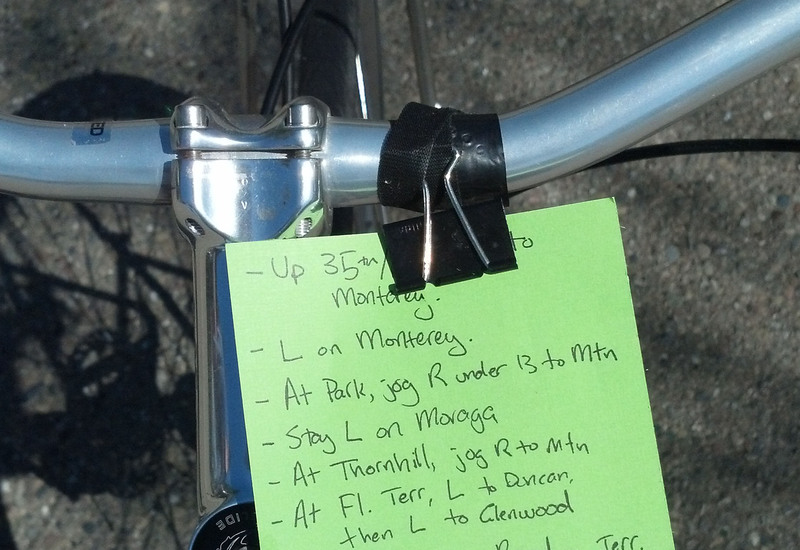 I’ve moved to Oakland from Berkeley, and so biking to things goes over longer distances and often I find that I need to bring a cue sheet. That meant I needed a way to hold a cue sheet. I already have a section of my handlebar taped over with electrical tape where I attach my front light, and so I just put a velcro cable tie through a binder clip and then around the taped area. The tape helps hold it in place and prevents scratching. Cue sheet made from electrical tape, binder clip, and velcro cable tie. Last weekend I was the event host for a trip from San Francisco to Point Reyes with the NorCal Bicycle Touring and Camping Meetup. We ended up getting six people together for the trip, all from San Francisco and Berkeley, except one coming in from Sacramento. I had picked up a camping permit for Sky Camp at Recreation.gov about two months earlier. It is still the rainy season in San Francisco in March, so we felt lucky to have a weekend of sunny weather predicted. On Highway 1, about ten miles south of Stinston Beach. 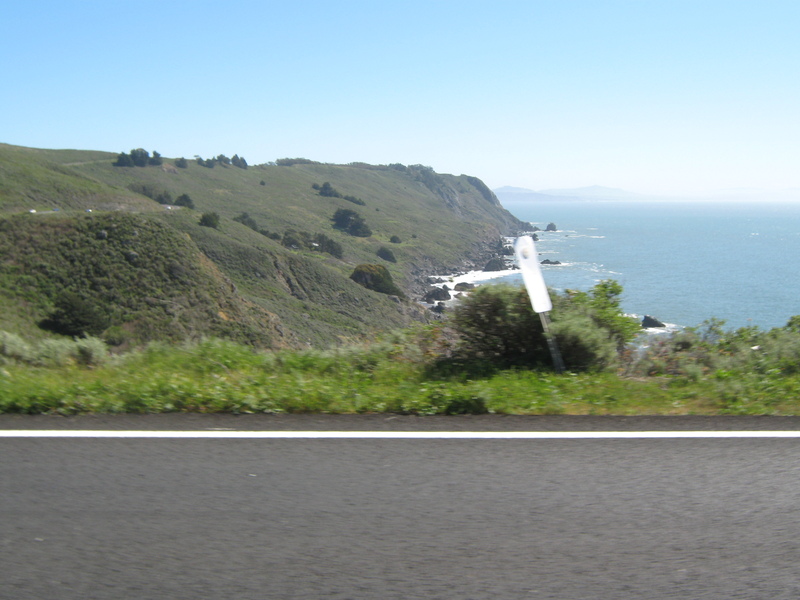 I planned the route, which was to go out on Highway 1 and back via Sir Francis Drake (Google Maps or Map My Ride; during the trip, we used the Marin County Bike Coalition’s map, which was up-to-date and accurate, $12 including shipping). The wind is usually from the north along the coast, so ideally we would have gone out Sir Francis Drake and back on Highway 1, but the ferry schedule didn’t really have a good Saturday morning option, so I had to go with the reverse route. New pictures of the American Southwest roadtrip — Berkeley, California to Pagosa Springs, Colorado, are now up on xenotropic.net. This was the first time in years that I’ve taken out my SLR, and it was a fun time and place to take pictures. The full moon helped to create some eerie effects, particularly at the Grand Canyon. Suzanne made me a tripod carrier for Christmas, which was great to make it easier to bring the tripod along everywhere. I got several pictures including constellations — Big Dipper and Pleiades. We also got started on winter camping, including camping in the snow at the Grand Canyon.